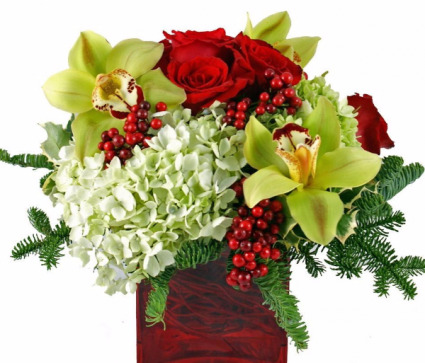 A glass cube with cymbidium orchids, red roses, berries, hydrangeas, and winter greens. Beautiful for any occasion and any room. Looks beautiful as a centerpiece. For longer tables we recommend 2 cubes on a table spread apart. 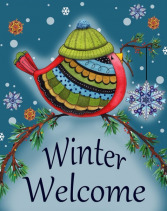 Call Sunnywoods today or order online now. We carry the most awesome selection of Garden flags. Great quality, mildew and fade resistant. Available in 2 sizes 12.5 x 18" 28" x 40" Many of our flags have matching indoor/outdoor mats. Mats are $25. Great quality Mats. 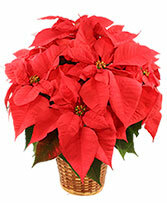 Red Poinsettias. 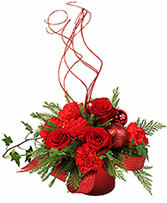 Foiled in gold or red with a beautiful festive bow or in a wicker basket. Several sizes available. Call if you would like a special color.